AT&T's contract with the Communications Workers of America (CWA) expired at midnight yesterday, and if the union's demands aren't met in contract re-negotiation, AT&T's wireline employees -- nearly 100 thousand in number -- will strike. "Enough excuses!" exclaims the CWA's Web site, "If AT&T really wants to lower health care costs, it should get off our backs and get on our side for national health care reform." The Union's main issue in contract negotiations is health care. AT&T's unionized wireline employees have an HMO with 100 percent of the premiums paid by AT&T, where the employees cover only the co-pay. AT&T reportedly wanted to have the union workers shoulder more of the financial burden, and the union wants things to stay as they are. AT&T said it spends $5.5 billion a year on health care subsidies for 1.2 million employees, retirees, and their dependents. Currently, between contracts, things remain the same. The Union has told workers that their old contract terms (wages, working conditions and benefits) will remain unchanged. However, the executive board of the CWA approved strike action on April 3 if fair contracts could not be reached in five AT&T operations: AT&T East, AT&T Midwest, AT&T Southwest, AT&T West and the nationwide AT&T Legacy. A strike could happen in any, or all of these divisions if concessions are not made. 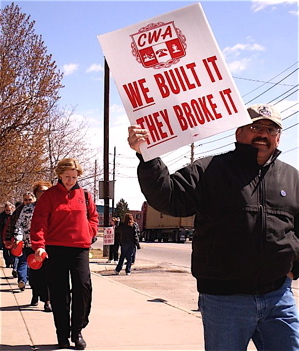 "The CWA bargaining teams are very frustrated by AT&T's slow pace in negotiations," said CWA Executive Vice President Annie Hill. "Instead of working toward quality settlements that will benefit workers and the company, AT&T negotiators chose to drag out negotiations without a plan for settlement." AT&T issued a statement yesterday morning, saying it "stands ready to negotiate at any time in a continuing effort to reach an agreement." In the meantime, union workers can download a ringtone for their AT&T phones called "Ready to Strike," which was written by a CWA member.